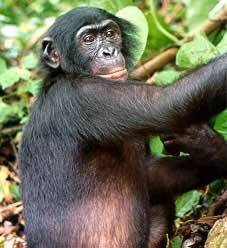 Bonobos are smaller than other chimpanzees. They tend to climb in the trees more than other chimps. They are more like monkeys in that way. ↑ 1.0 1.1 Pous, Dinorah (2003). Blue Planet English through Science level 5. Alpha Omega Publications. ISBN 970-10-3769-3 . ↑ 4.0 4.1 "Jane Goodall's Wild Chimpanzees". PBS. 1996. http://www.pbs.org/wnet/nature/episodes/jane-goodalls-wild-chimpanzees/introduction/1908/. Retrieved 2010-07-28. ↑ Mitani J.C; Watts D.P. & Amster S.J. 2010. Lethal intergroup aggression leads to territorial expansion in wild chimpanzees. Current Biology 20 (12) R507/8. ↑ Buskey, Teresa K. LIFEPAC History and Geography. Alpha Omega Publications. p. 39. ISBN 978-1-58095-155-5 . ↑ The Chimpanzee Sequencing and Analysis Consortium (2005). "Initial sequence of the chimpanzee genome and comparison with the human genome". Nature 437 (1 September 2005): 69–87. doi:10.1038/nature04072 . PMID 16136131 . This page was last changed on 6 July 2014, at 17:02.